I’ve been working on this quilt for about a month now and just finished. I decided I wanted to make a quilt for our summer bed at our cottage in the redwoods. 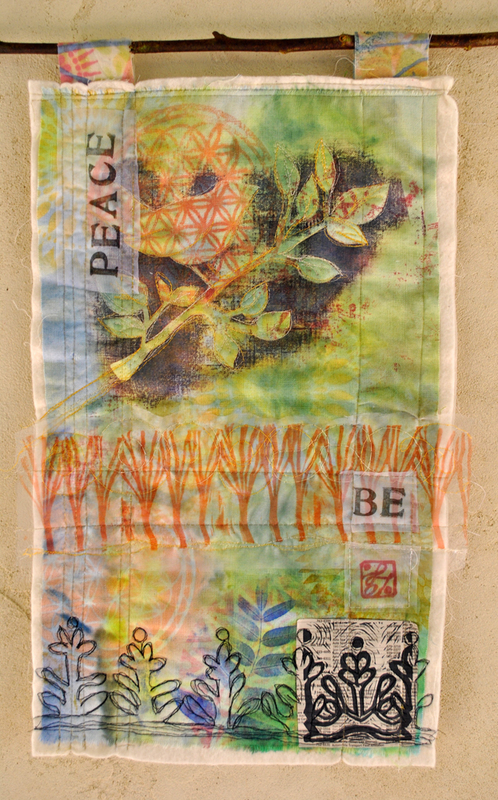 I wanted to the quilt to fit with the environment so I set up to do some gelli printing printing in my driveway deep in the Redwoods of Cazadero. I used only plants surrounding the house; ferns, bracken, maple along with some bird stencils I made to invoke our flickering feathered friends. I made about forty 12×12 squares in indigo, teal and grey. A couple of weeks later I set up my sewing machine with a quilting group on retreat at The Bishop’s Ranch and got to stitching. This quilt catches the peaceful feeling of our beautiful redwood home, full of tranquil inspiration, making a functional art piece in a place of a place – serenity all wrapped up in a humble quilt! PS. I wish this photo was taken in the redwoods instead of at The Bishop’s Ranch but I didn’t want to delay in sharing this with you! 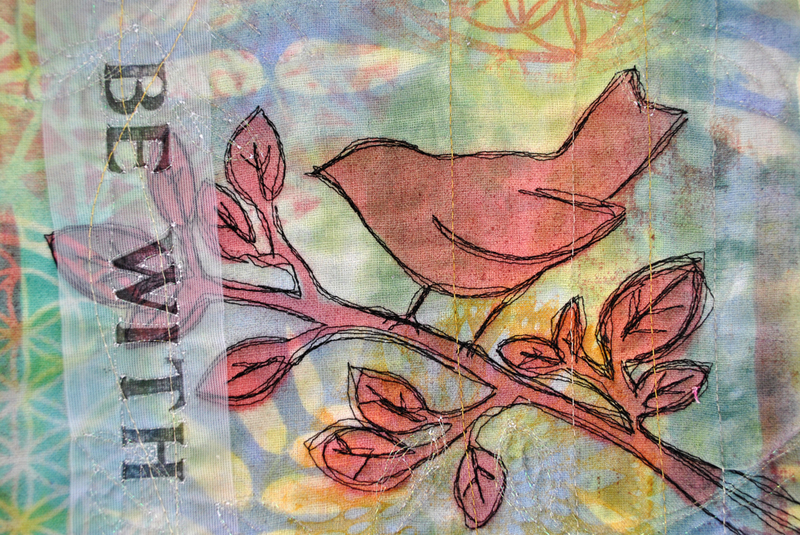 I’ve been teaching gelli printing on fabric at The Bishop’s Ranch where I’m the resident artist- and I have some workshops lined up with several quilt guilds in the coming year- if you would like to arrange a print on fabric class here at the Bishop’s Ranch or wherever you are- contact me on to start planning! 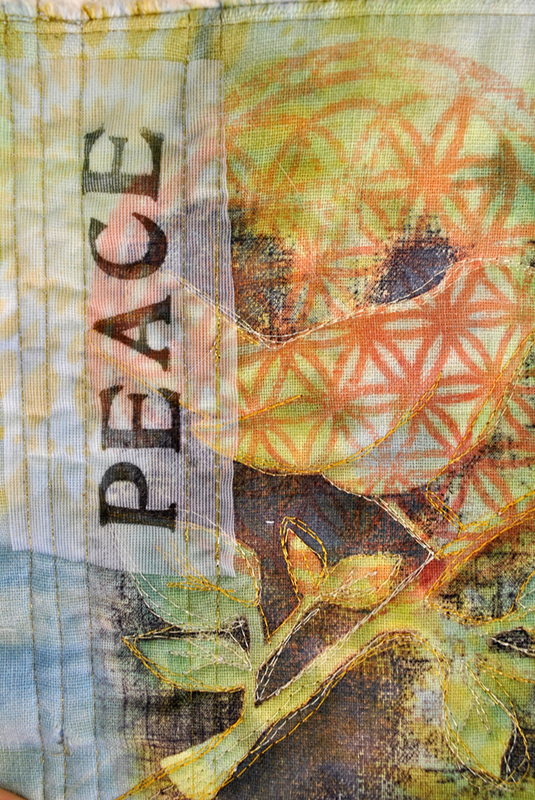 About a month ago I shared a series of peace quilts I’d made. 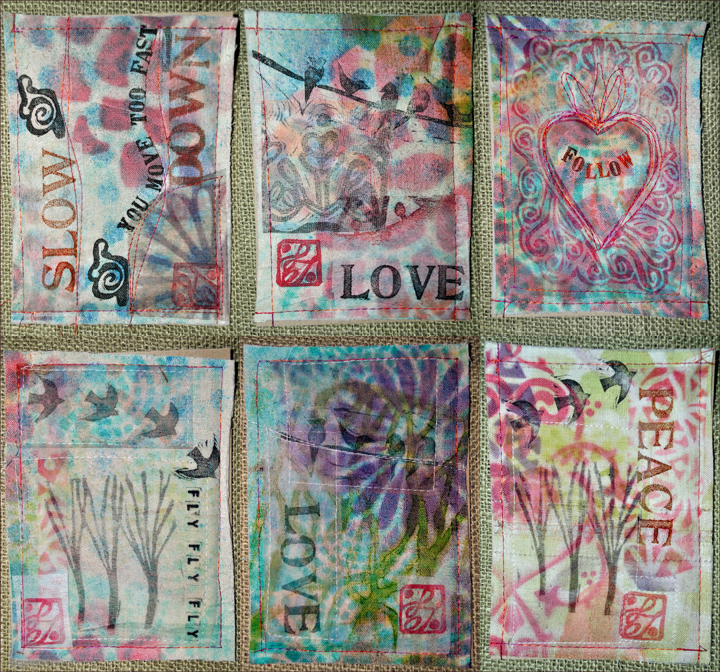 With the scraps from the fabric that I had created I made some 5×7 mini quilts that I stitched to card stock and made into mini quilt cards. I stashed the cards away in a box ready to send. I found myself reaching into that box numerous times this month, two dear friends had close family or friends pass away this month, another friend is going through chemo treatment. Sometimes it’s hard to find the right words to send to a friend in need and what is most important is to just let them know they are in your thoughts. I found these cards hit the right note. They are a little piece of me- my art and my heart. 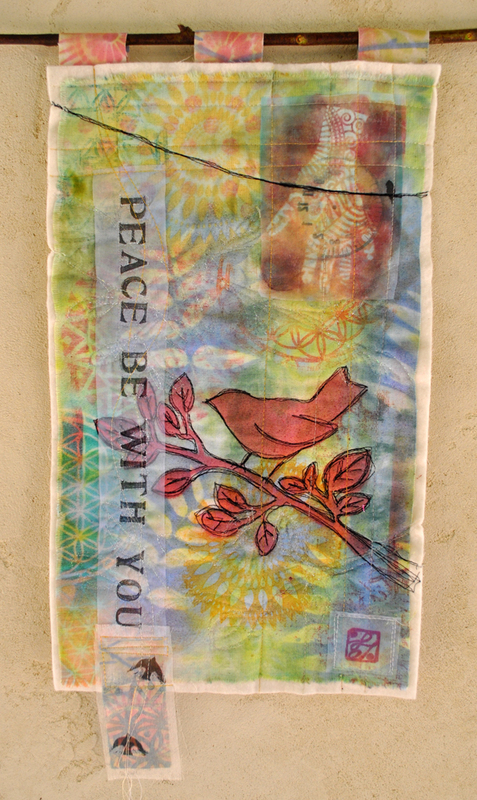 I recently created more fabric using my new favorite medium, Tint It spray with stencils. 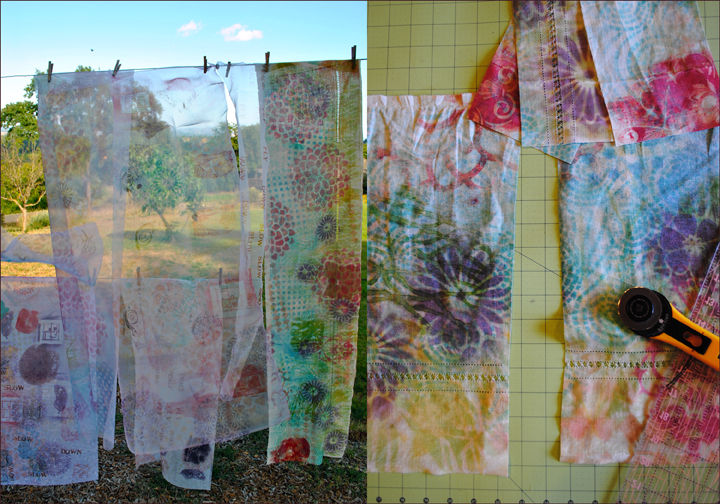 I sprayed on linen, organza and tulle(left). Then cut it up into 5×7 inch blocks to create the cards (right). I used so many that I made a whole stack this week to have at the ready to express my affection and concern and hopefully give a little bit of inspiration to someone I love. Pomegranate picked from my tree this morning and cut through at the equator. Today I was given a little gift, a surprise, a wonder. 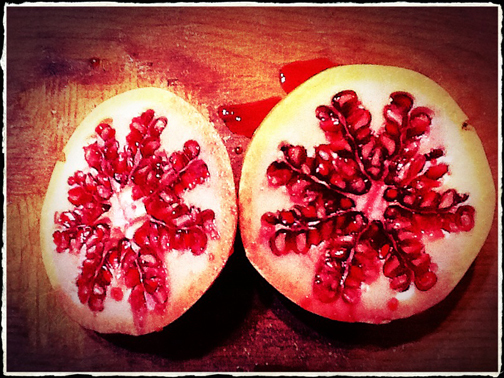 When I cut open this pomegranate today I was presented with a perfect mandala. What is funny about this gift is today for some reason, perhaps the early hour, or dim lighting, or the dream cobwebs still in my eyes, I cut this pomegranate open in a different way. Usually I cut it open through the stem or tear it open at a crack but today I cut through the equator of the fruit, and look what I found! A star, a sun, a snowflake dripping with crimson abundance. It seemed auspicious, a favorable sign from the universe, a reminder that sometimes all we have to do to be alive to the wonders of this life is to cut it open in a different way. Try it you never know what you might find! Enter your email address to follow this blog and receive notifications of new posts by email. WordPress will send a confirming email. Check your email filter, some subscribers have reported finding that email in their Junk Mail.